Nicole's Needlework: New yarn and some mud! 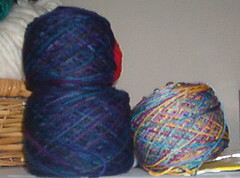 I went to Knitting Emporium today in Kennesaw and got some new sock yarn. Mountain Colors Weavers Wool Quarters in "Thunderhead," and Cherry Tree Hill Supersock in "Earth." I also got some size 1 dp needles and some Cascade 220 for my mom to make some Felted potholders from the Last Minute Knitted Gifts book. 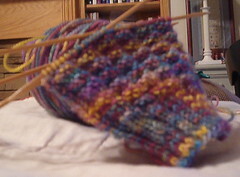 This is a really fun sock so far! I cast on 60 using the size 1 needles I got. Ok for the mud part. As I was leaving the yarn shop my truck got stuck in the mud. I mean really stuck! Thankfully my husband wasn't too far away and a nearby tow truck drived owed him a favor. I was so embarrased! I know to park across the street from now on if the parking lot in back is full!! Well, better go Jake is throwing a tantrum! !